It’s the end of Week Two and I’m starting to get impatient. The zests are starting to look faded and whitish, and the vodka darker orange & yellow (especially the Clemencello). Now that I’ve begun this endeavor, I’m starting to think about related projects I can tackle (Blood Orangecello? Spiced Rum?). There’s also an unrelated, but equally cool project that I will be getting started on this week. 2 more weeks until the last step & taste-testing of my homemade booze! I’ve been dealing with my holiday stress with cooking and recently, baking. I wasn’t planning to blog about it, but I’ve been posting pix of my cookie-making adventures on my Instagram, and peeps have been asking, so here goes! First of all, I’m not a fabulous baker. I took pastry in culinary school, but I feel like I’m more of a cook than a baker. I’m not very exact when I cook, and you have to be really exact with pastry. Also, it’s very challenging for me to make my baked goods pretty I typically don’t have a steady hand like that. Usually if I’m baking it’s a rustic bread. (Rustic is code for messy.) The first cookie I made was Chocolate Chip with Candied Bacon. Because bacon. The kids helped me candy the bacon, which I hadn’t done before. The process was so simple, it got my wheels turning about other things I could easily candy. Stay tuned for that. The cookie itself was ok, although I feel like there was too much STUFF and not enough cookie. If I make another round (and I probably will) I will probably keep the 8 slices of bacon and halve the chocolate chips. Check out the recipe I used here. 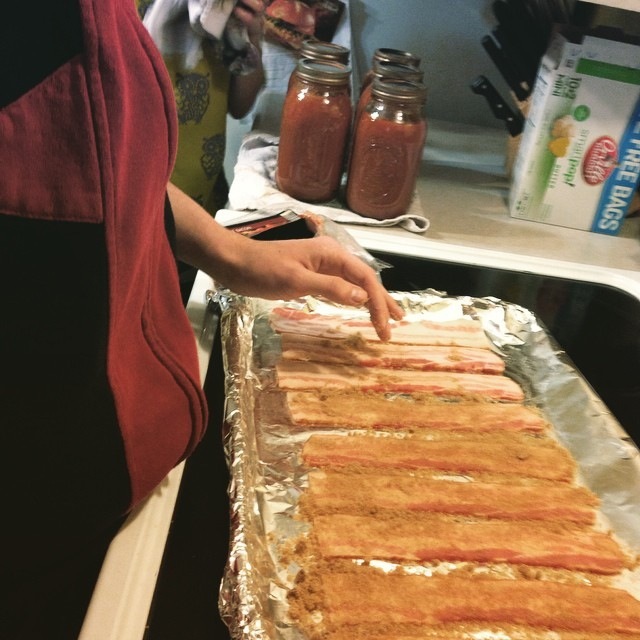 My kids, prepping the candied bacon. Freshly canned tomato sauce in the background. Next batch were pfeffernusse. 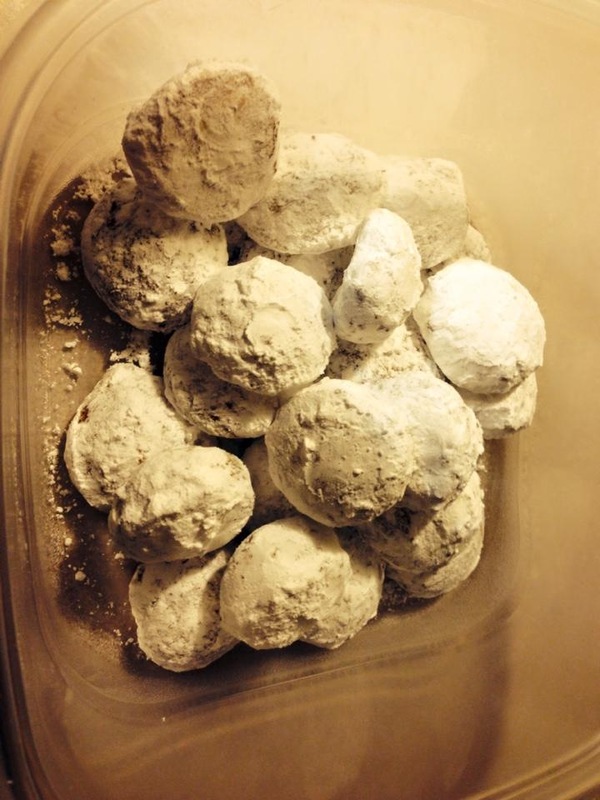 Pfeffernusse are one of my favorite cookies, and the thought of baking them was both exciting and scary. I used Aunt Martha’s recipe, which was comforting, because her recipes are almost always successful. Fun fact: I have a homemade plaque in my dining room that reads WWMD (What Would Martha Do). The pfeffernusse were super-easy to make and spicy and delicious. I guess they are a little biased, but my kids said they liked them better than store-bought. This recipe was a definite WIN! Martha’s Pfeffernusse recipe here. Finished pfeffernusse ready to devour. Next were Italian Rainbow Cookies. I decided to give them a go 1) because I love them and 2) because I’m making an Italian feast for Xmas. The recipe I used was Lidia’s- of Lidia’s Italian Restaurant in KC so I figured that was a good start. They were REALLY involved to make (2 days and lots of steps) but they came out delicious. The only thing I would change is that I used full-size sheet pan, not the jelly-roll size the recipe called for. If I had a jelly-roll pan, I feel like I wouldn’t have had to do as much trimming. My son told me they reminded him of Jaffa Cakes, probably because of the jam (which is apricot, not orange like in Jaffa Cakes). This is high praise from him, my kids both get Jaffa Cakes in their stockings each year. Lidia’s Rainbow Cookies recipe here. See photo above. Today I prepped my last holiday cookie. Almond Biscotti. I have also not made biscotti before, but it was another Martha recipe, so I was pretty confident. But, as I started to make the dough, I got a little worried. There is no butter or oil in the dough. In fact, the only liquid is the eggs and vanilla extract. While the dough tumbled away in my mixer it appeared more than a little DRY. How would I ever roll this into a log?? But fear not- once I added the almonds and started to press the dough together it did stick and make 2 nice logs. (Perhaps the oils in the almonds helped?) 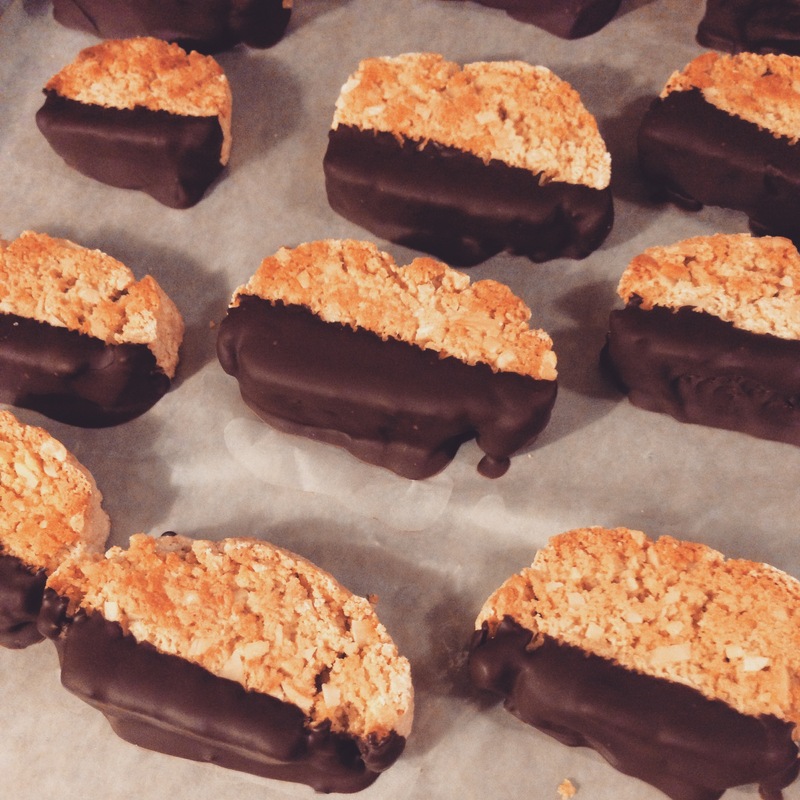 Biscotti is baked twice, once in log form, and again sliced into discs. This recipe made a nice crunchy, crumbly biscotti. They were not quite as pretty as the store-bought variety, but had a very good flavor. I had leftover melted chocolate from the rainbow cookies, so I dipped half of each one into the chocolate and chilled it in the fridge. Martha’s Almond Biscotti recipe here. Finished biscotti are not gorgeous, but had a great flavor. So I had a lovely Xmas eve photo-op planned for this post. A plate full of my homemade cookies, out on the coffee table for Santa, beautifully lit Xmas tree in the background. My pup, River Song, had other plans. When they were left unattended she gobbled up ALL of Santa’s cookies. 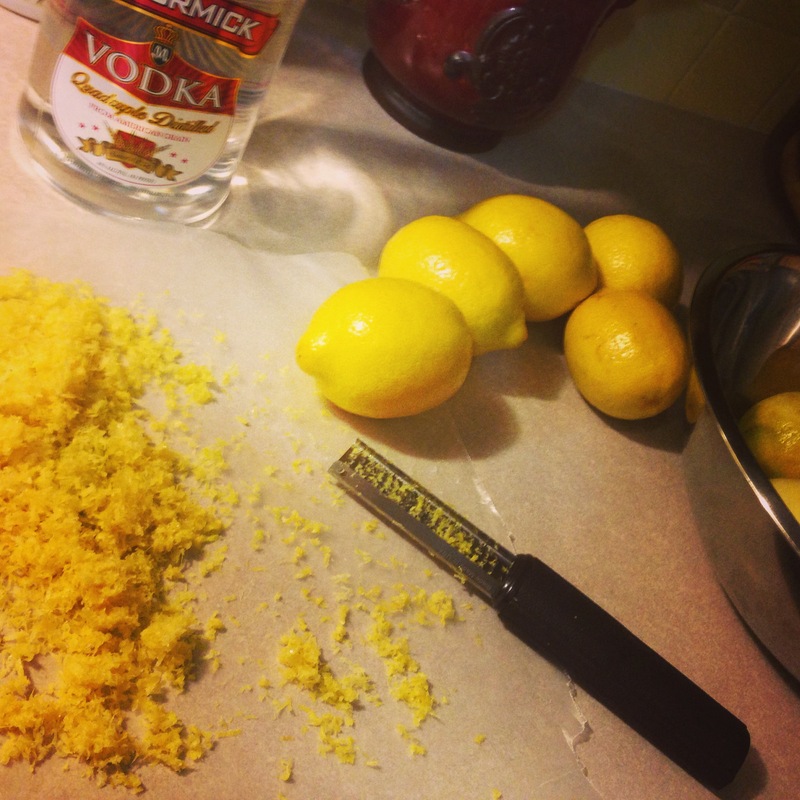 This week I decided to try my hand at making my own limoncello. Which is simple so far, but once I started I was inspired to try making a clemencello, that is a limoncello made from clementines instead of lemons. Basically, limoncello is an adult lemonade. The lemony flavor and bright yellow color come from the citrus oils in the zest of the lemons. You can drink it straight or mix it with something like iced tea for a twist on an Arnold Palmer. By the way, in the above pic, that’s Clemencello-to-be on the left, Limoncello-to-be on the right. I don’t know for sure yet, but I’m estimating this will make 6-8C of finished product. Zest the lemons. The pith, or white layer of the lemon is bitter so be careful to only grate off the yellow part of the peel. Here’s a pic of the lemons being zested. 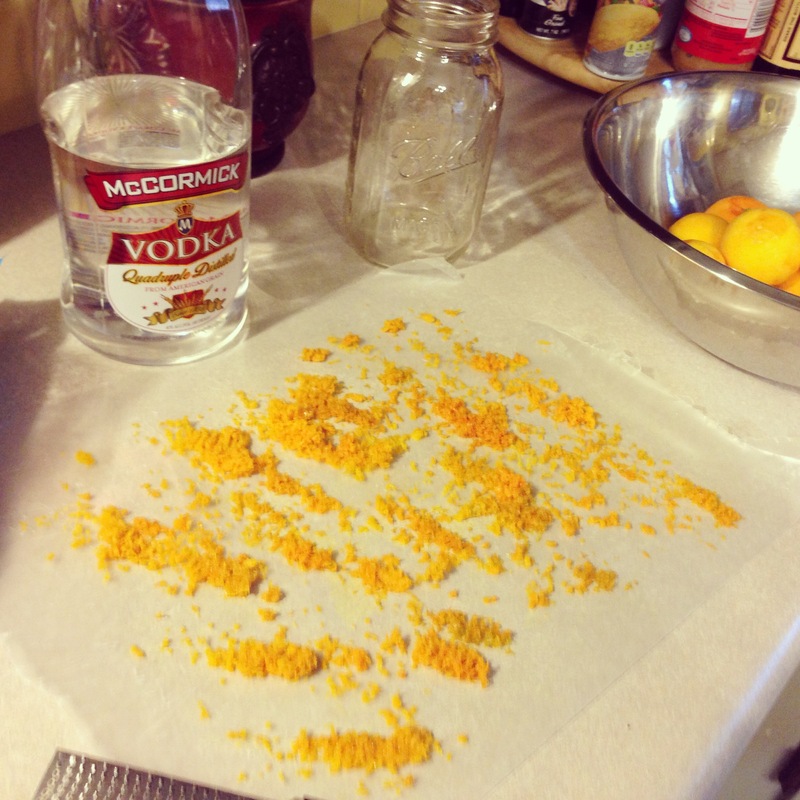 In a large jar combine the zest and vodka. Shake jar each day to evenly distribute the flavors. Makes an estimated 6-8C of finished product. Zest the clementines. The skin of the clementines is thinner and more oily than the lemon zest so less is needed. Much less zest came off the clementines but it was much wetter, so I think it will pack a bigger flavor punch! So now I play the waiting game while the limoncello/ clemencello gets all infused and happy. Stay tuned for chapter 2! Follow the story day-by-day on my Twitter and Instagram! Nothing says “Happy Holidays” like coughing & sneezing and nothing cures whatever ails you like homemade matzoh ball soup. Today I’m battling bronchitis & I made some delicious matzoh ball soup using some of the turkey stock I made from out Thanksgiving carcass. You can make this soup with canned stock or broth, but it will always be more delicious with homemade stock. Homemade stock is easy to make & costs pennies. This recipe made 5 quart size mason jars. Heat EVOO in a large stockpot over medium-high heat. Put in carrots, celery, and onions. Sweat over medium-high heat until onions are translucent, about 5-7 mins. Put in your turkey carcass and neck and add water to cover. Season water with a few pinches of Kosher salt. When stock reaches a rolling boil, cover, let simmer over medium-low heat 2-3 hours. Allow to cool then strain through colander and cheesecloth before putting into containers to freeze or into jars for canning. My matzoh ball soup making set-up. In a small bowl, mix together eggs & oil or schmaltz. Schmaltz is the classic way to make matzoh balls, but nowadays most people don’t keep rendered chicken fat lying around the house, so vegetable oil is fine. Add matzoh meal, and a pinch of kosher salt, if desired. Cover mixture and chill at least 1 hour. Put stock in a large pot on the stove top and begin heating over medium-high heat. Meanwhile, take your mixture out of the fridge and start rolling your matzoh balls onto a wax paper-covered baking sheet. Matzoh balls should be about 1 inch in diameter. 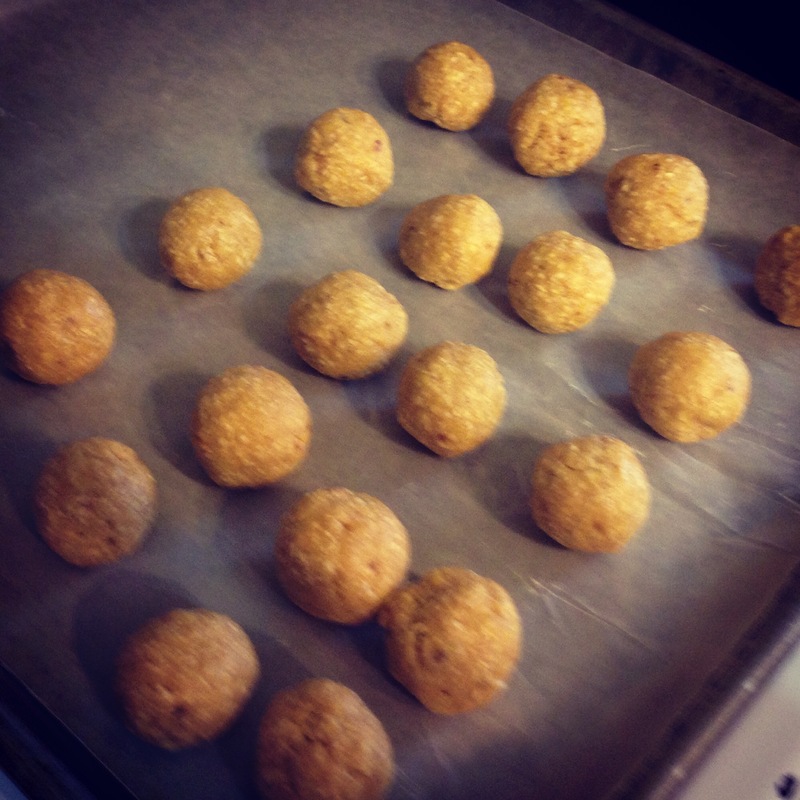 Matzoh balls rolled out ready to take a bath in the stock. 6. 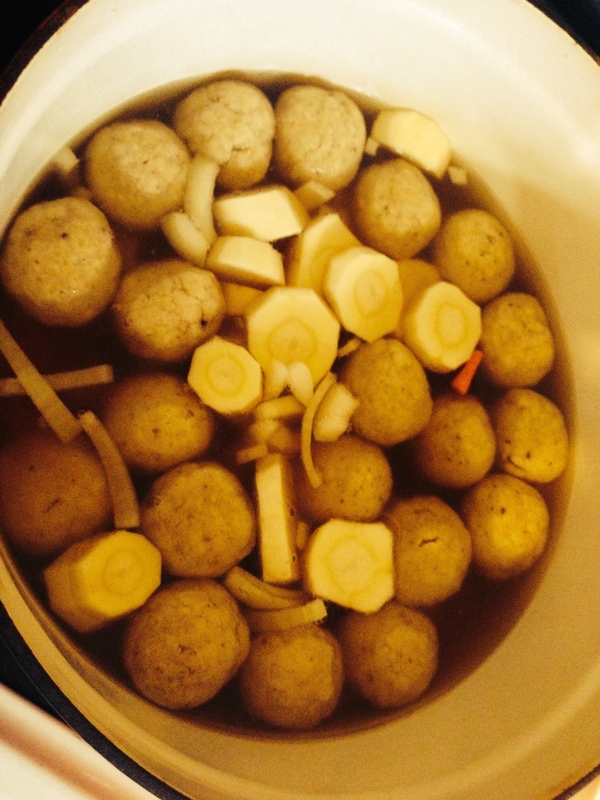 When stock comes to a rolling boil, add the matzoh balls. Lower heat to medium-high, cover tightly, and cook at a simmer for about 10 minutes. 7. Add in the carrots, parsnips, and onion. Cover, and cook 10-15 mins at medium-high heat. 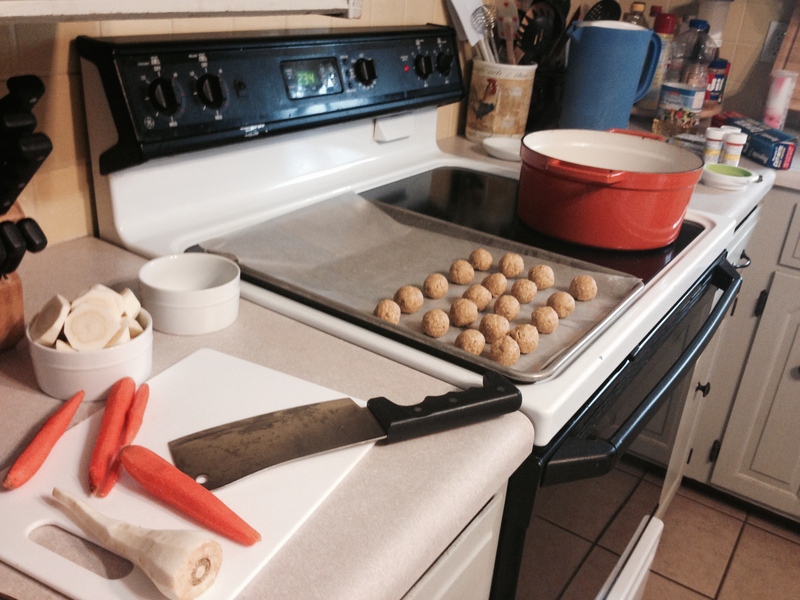 Matzoh balls and veggies cooking together. 8. To serve, put 2-3 matzoh balls in bowl and a few veggies. Pour broth over and garnish with fresh dill, if desired.